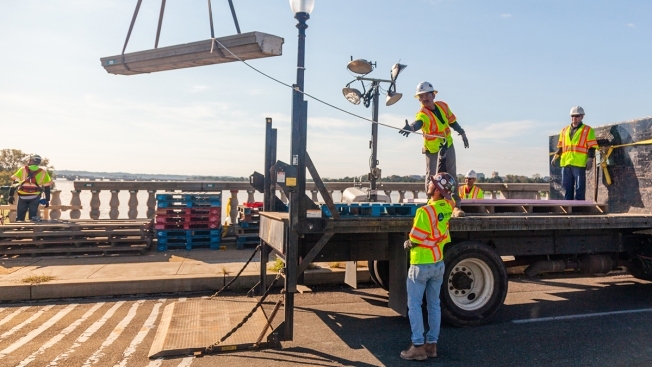 This NPS file photo shows the removal of a balustrade on the Arlington Memorial Bridge as part of the massive project. The balustrade has been moved off-site for cleaning and repair. One of the bridge's three available lanes will close for several hours at a time. Another lane will temporarily close for roughly 15-minute periods. Flaggers will direct traffic and will intermittently stop drivers to allow them to share the single lane. Big changes are coming to the Arlington Memorial Bridge starting Monday night for the latest phase in a major bridge rehabilitation project. Since last October, the bridge has had only three of its usual six lanes open to traffic. Now, crews will further reduce the number of open lanes each night from 9 p.m. to 5 a.m.
One of the bridge's three available lanes will close for several hours at a time, and another lane will temporarily close for roughly 15-minute periods. This means that only one lane will be open during those times. Flaggers will direct traffic and will intermittently stop drivers to allow them to share the single lane. This will allow workers to install a new surface on the bridge, the National Park Service said. The closures will be in effect until fall. The bridge began its three-lane traffic pattern last October. During the morning rush, two lanes are open heading into D.C. and one lane is open into Virginia. The pattern reverses for the afternoon rush, with two lanes into Virginia and one lane into D.C. The NPS has set up guides to help drivers, bicyclists and pedestrians handle the new traffic patterns.